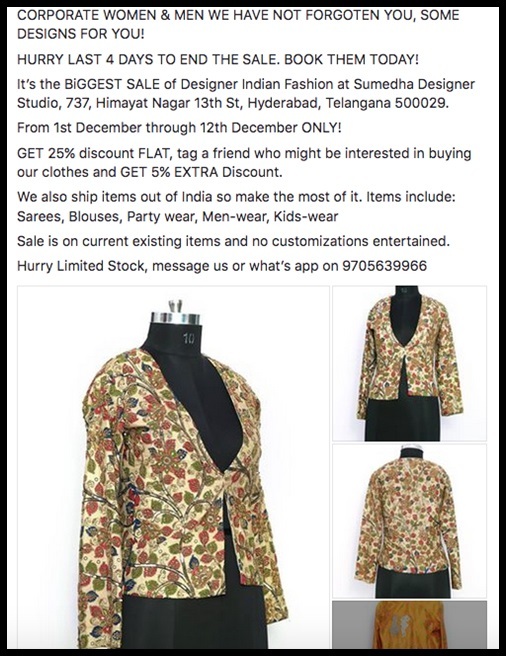 Sumedha Designer Studio, owned by “Ms.Priya” is known for its unique designs of clothes including Men’s Wear, Bridal Wear, Kids Wear along with Corporate Attire. Sumedha Designer Studio approached Branding by Pixels for Facebook Marketing for their brand. Their objective was to drive sales for their designs which were up for sale. 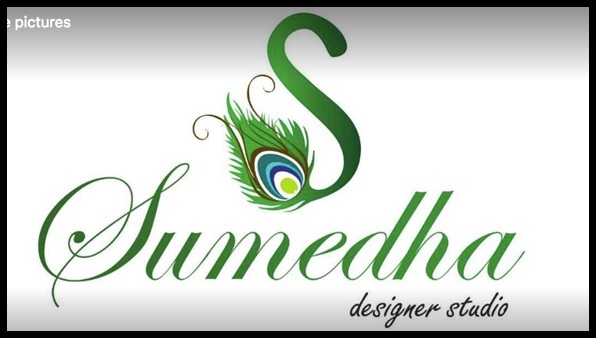 Branding by Pixels, suggested Sumedha Designer Studio get appropriate Visual Content created to segregate relevant designs. We even suggested a photographer who can help them with the creation of Photos. Once the photo shoot was done, we then starting using the content to be posted on the Facebook page with appropriate written content to make it an interesting read. 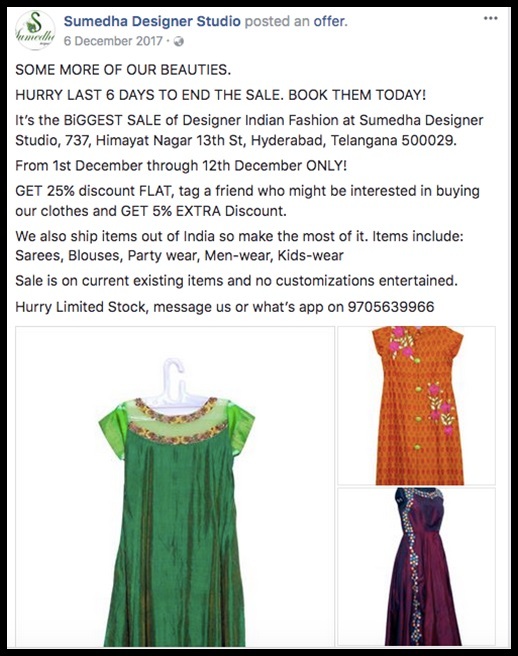 Then, we started sharing the posts in relevant Facebook groups as organic means to create awareness regarding the sale. Similarly, we segregated clothes depending on “Kids Wear”, “Corporate Wear”, “Men’s Wear, “Party Wear”. 1. 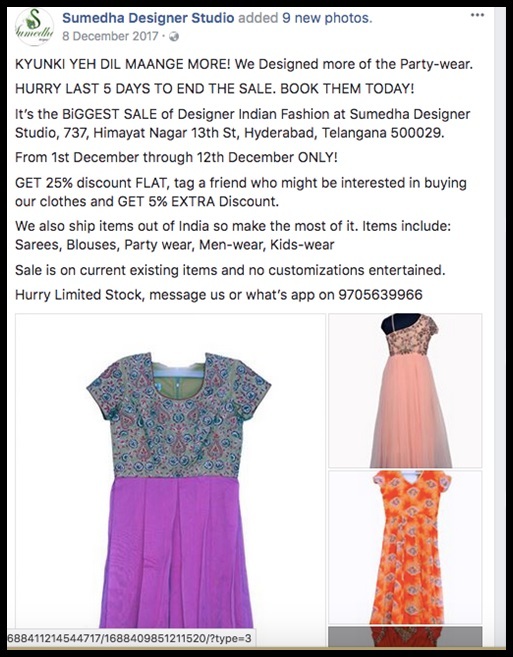 Due to constant posts and sharing the posts in different relevant Facebook groups we were able to increase the engagement on the page by 100%. 2. 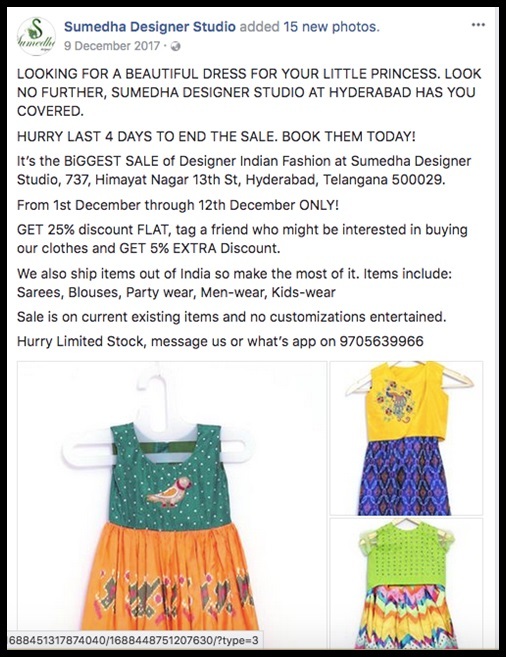 Also due to the activity that we have done on Facebook, Sumedha Designer Studio also got 200 whats app message with enquiries regarding the sale.